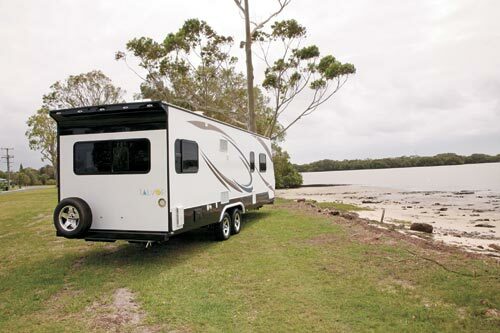 Talvor – best known for its motorhome production (rental and private) – entered the caravan market a year or so ago. Its van line-up varies in length from 5.6m (18ft 3in) to 7.59m (24ft 11in) – the latter badged as the 750 range, with the 750C being one of the first to emerge. The 750C has a vaguely US look around the outside, and that impression is reinforced on the inside, where everything has Stateside overtones, especially the darker timber hues and the mottled walls. None of this is surprising, given the 750 range is actually built in the US! 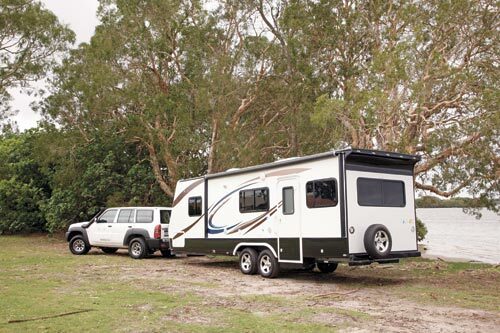 What the 750C isn’t, however, is a US-built caravan modified for Australia. 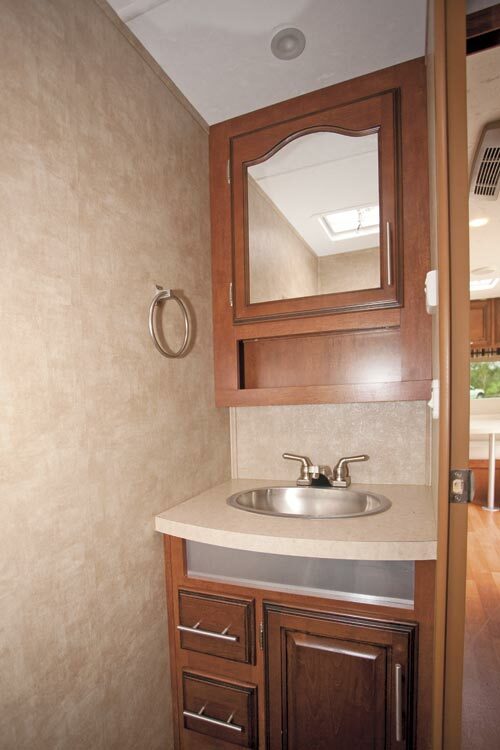 Rather, it is an Australian/Talvor-designed caravan built in the US. A small but important difference! 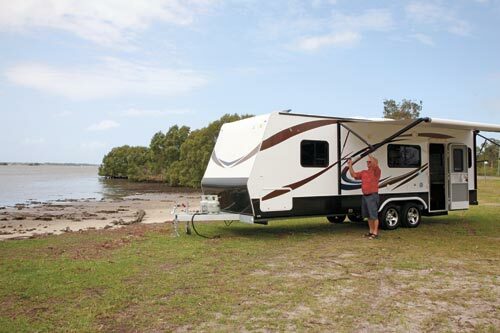 At nearly 7.6m (25ft) and with an ATM of 2750kg, what you get is a considerable amount of caravan, and one that takes a step away from the ubiquitous front island bed/full-width rear bathroom layout. Instead, while the 750C still has a front island bedroom area that comes with an adjoining split bathroom, it comes with a mid-station kitchen and an asymmetrical club lounge in the rear. A look under the 750C reveals a slightly different chassis construction to the more usual box-section style with RHS rails and cross-members. Instead, two 150mm ‘I’ beams run the length of the van and are braced by 140mm ‘C’ section cross-members. Still conventional, though, is the drawbar, with 150mm RHS arms and a ball coupling. At the rear, the water tanks (148L for fresh and 83L for grey) are mounted between the I beams. Over an aluminium SHS frame, gel-coated fibreglass panels with an insulation layer are used for the walls and roof. 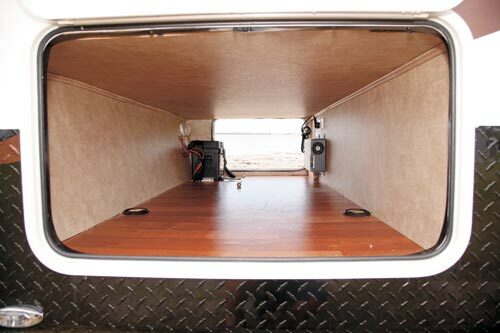 A slightly unusual feature is the relatively large air deflector fitted at the top of the rear wall, which, aside from anything else, does give the van a different look. The other slightly unusual feature is the wider-than-usual door (0.71m or 2ft 4in). All the windows are tinted glass and have sliding openers, either horizontal or vertical. A wide front tunnel boot takes the place of a front boot, with the battery and charger near the offside bin door. 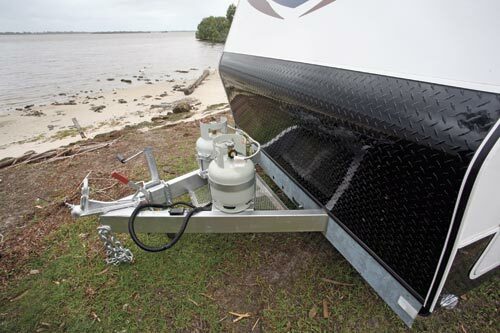 The electric awning is there for caravanners who don’t like hard work! 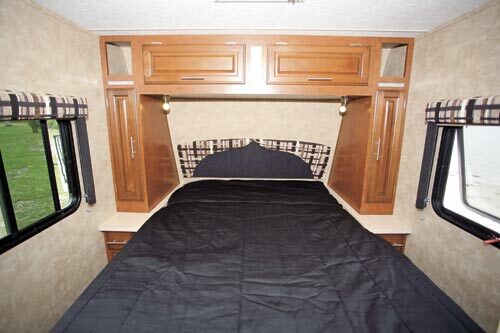 The length of the 750C has allowed the layout designers plenty of scope for the interior layout, which is a neat split between the front bedroom/bathroom area and the rear kitchen/living area. One of the benefits of this caravan’s rear club lounge is that when stepping inside the door, it’s an instant welcome to sit down, put the feet up and relax – especially as there are no corners in the leather seat backs. The table, while certainly large enough, is fixed in place, unable to swivel. Given the size of the lounge, there’s plenty of space above for a selection of overhead lockers. The side ones are quite narrow, while the forward offside locker is used for a flatscreen TV mount. Instead of one long kitchen bench, the 750C’s is split in two across the van; a fairly practical arrangement. Fitted into the nearside bench are a four-burner cooktop, grill and oven alongside a stainless steel sink and drainer. Three good-sized drawers are fitted under the sink, the middle one having a cutlery tray insert – it did seem to me that it might be better on the top drawer, though! Like the rest of the 750C, all the drawers are fitted with metal runners and have easy-grab handles. There isn’t a great deal of benchtop working space on the nearside but that’s been catered for (pun intended) on the opposite side. Adjoining the 186L fridge cabinet on the forward side is a waist-high cabinet. This not only gives bench space but hides the top-loading washing machine fitted below while allowing for a microwave to be fitted above. With a full-height, multi-shelved pantry nearby, this is a kitchen with plenty of storage space! Some people don’t like them, but there is much to be said for a split bathroom – in a tight internal space, it’s often more practical. 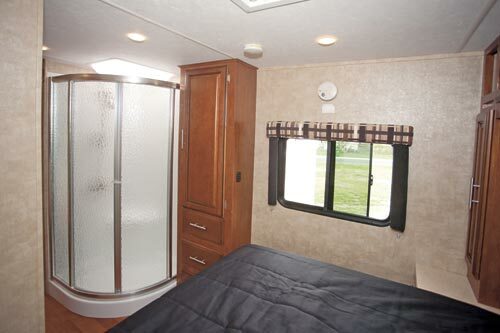 Not that space is a problem in the 750C as the split bathroom, acting as a barrier between the living area and the bedroom, has a roomy shower cubicle on the nearside and a toilet/vanity cabinet opposite. The large translucent hatch in the shower cubicle acts as a sort of skylight during daylight hours. Like the shower, the toilet cubicle offers plenty of space, with the Thetford cassette at one end and a full-height vanity cabinet at the other. There’s a bit of a compromise in the bedroom, but I reckon it’s a good trade. The mattress measures 1.96x1.52m (6ft 5in x 5ft), which makes it longer than most caravan beds and good news for anyone over 6ft (1.83m). The downside, of course, is that it makes for a fairly tight space to walk around. In addition to the usual bedhead of overhead lockers, bedside wardrobes and cabinets is the wardrobe and drawer cabinet that adorns the space outside the shower cubicle – a good feature given the lack of clothing storage elsewhere. On the road, the 750C is a good handler. Although its towing length is nearly 9m (30ft), it’s not a difficult haul. Even its ATM of 2750kg does not mean a supersized tow vehicle will be required. 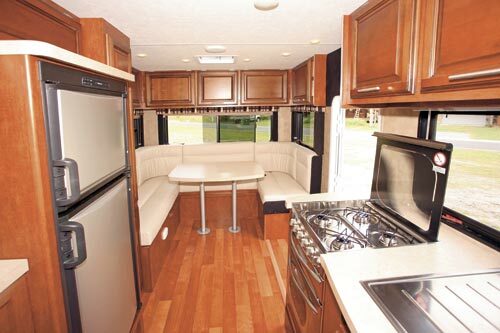 The Talvor 750C certainly isn’t a small van and it’s nice to see the layout designers have come up with a plan that offers an all-over comfortable living interior, with the emphasis on the large rear lounge. I did wonder, however, if 200mm or so could be shaved off the lounge area and added to the bedroom space. The 750C certainly shows its US-built influence but it seems to have been ‘Australianised’ enough to keep most travellers happy – certainly all the appliances have the necessary Australian certification. Overall, this is a very interesting offering in the growing Talvor caravan range. 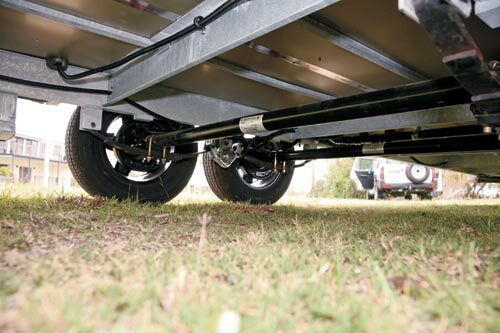 A look under the 750C reveals a standard tandem-axle leaf-spring suspension arrangement, except that it’s a US-sourced Trailair Equa-Flex system built by Lippard Components. The item of interest in this case is the fitting (Equa-Flex) between the leaf-springs. Designed as a loadsharing system, the Equa-Flex equaliser acts as a rubber cushion between the front and rear leaf-springs, which not only gives a load sharing effect between the fore and aft wheels but also is used as a method of absorbing the shocks between the wheels, thus reducing wear and tear. That’s not to be confused with the function of shock absorbers, which are not fitted to this caravan’s suspension system. Cutlery drawer at the top! Originally published in Caravan World #515, June/July 2013.